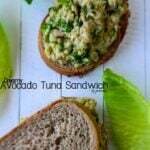 Tuna Salad without Mayo is packed with flavors and can be served as a sandwich as well. The garlicky mint vinaigrette takes it to the next level and you are never bored of it. We’ve enjoyed it all summer using various herbs and fruit in it. You know we started a No-Mayo Salad Recipe Series two weeks ago and this Tuna Salad without Mayo is the third recipe of this series. Have you seen our Healthy Egg Salad and Greek Yogurt Chicken Salad, which are the first and the second mayo-free salad recipes of the series? I’m just trying to show that it’s possible to make super tasty and satisfying salads in a healthier way with these recipes. Hope you have a chance to try these recipes because they are as tasty as their alternatives including mayonnaise, with no extra calories though. Is it early for back-to-school recipes? I think it’s always better to be prepared before that day comes. You can bookmark this recipe to make it later because it makes a great school lunch too. Do you think kids won’t want to eat tuna salad without mayo? Believe me they will LOVE it especially when you add their favorite fruit in it. If you are planning to make the salad for your kids’ lunch box, you can put it on toasted bread or sandwich it between whole wheat bread slices. We love fresh fruit in salads and this one is no exception. We’ve tried it with watermelon, peach, cherries so far and all of them worked great, so you can go with your favorite fruit or whatever fruit you have on hand. For example, we had grapes and apricots when we made the salad for this post, so you see them on top of our salad in the pictures here. Have I already told you that the garlicky mint vinaigrette plays a significant role in this tuna salad? It not only gives a very nice refreshing and appetizing effect, but it also matches wonderfully with the sweet flavors of fresh fruit. For the best vinaigrette salad dressing, you can basically use 1 tablespoon of lemon juice (or vinegar) and 3 tablespoons of olive oil. Add in salt and black pepper to your taste. You can improve your vinaigrette with other favorite ingredients. If you want to make a big batch and store it, make your vinaigrette in the basic form; only with lemon juice (or vinegar), olive oil, salt and pepper. Add the other ingredients like herbs, garlic or mustard right before using it. I find it easier to shake everything in a small jar so that everything is combined well and I can re-shake it if oil and lemon juice separate. I used fresh mint because I love its refreshing flavor, but you can use basil or parsley as well. 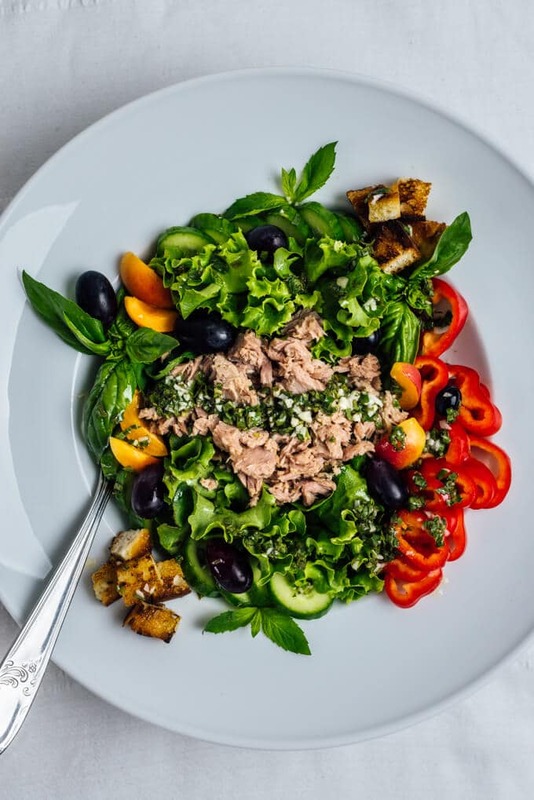 Tuna Salad with a refreshing and appetizing garlicky mint vinaigrette. 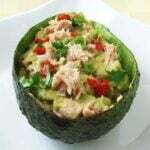 In a large salad bowl, combine lettuce, mint, basil leaves, sliced cucumber, red bell pepper and drained tuna. Top with sliced apricot, grapes and croutons. To prepare the vinaigrette, put all ingredients in a small jar and shake well. Drizzle it over the salad, toss and serve.